Return to the 80's. The music, the cars and the characters. The follow up to Life On Mars Ashes To Ashes sees the return of DCI Gene Hunt (Philip Glenister) - but he is no longer the self styled 'Sheriff Of Manchester' - drawn by the action and intrigue of the London Met Gene's turned his attentions to taking on the 'southern nancy' criminal scum! He is joined by his faithful sidekicks Ray Carling (Dean Andrews) and Chris Skelton (Marshall Lancaster). DCI Alex Drake is thrown into the mix - after suffering a horrific accident in 2008 she finds herself in 1981 alongside Hunt and his team. 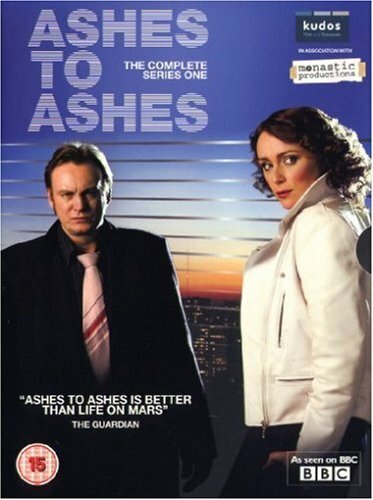 8 episodes of Ashes to Ashes the BBC's follow-up to Life On Mars starring Philip Glenister and Keeley Hawes. The follow up to Life On Mars sees the return of DCI Gene Hunt (Philip Glenister)! But he's no longer the self styled 'Sheriff Of Manchester' - drawn by the action and intrigue of the London Met Gene's turned his attentions to taking on the 'southern nancy' criminal scum! He is joined by his faithful sidekicks Ray Carling (Dean Andrews) and Chris Skelton (Marshall Lancaster). DCI Alex Drake is thrown into the mix - after suffering a horrific accident in 2008 she finds herself in 1981 alongside Hunt and his team. The follow up to Life On Mars Ashes To Ashes sees the return of DCI Gene Hunt (Philip Glenister)! But he's no longer the self styled 'Sheriff Of Manchester' - drawn by the action and intrigue of the London Met Gene's turned his attentions to taking on the 'southern nancy' criminal scum! He is joined by his faithful sidekicks Ray Carling (Dean Andrews) and Chris Skelton (Marshall Lancaster). DCI Alex Drake is thrown into the mix - after suffering a horrific accident in 2008 she finds herself in 1981 alongside Hunt and his team. The 80s are back and it's criminal!